Woofreakenhoo! 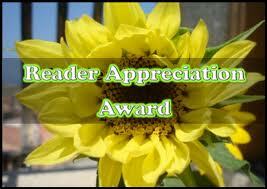 The lovely Kate http://katepolicani.com/ has nominated me for the Reader Appreciation Award. Like Kate I love getting these. It makes writing the blog worth it. Thank you Kate. My favorite color is really two, light pink and white. While I love wearing all colors these are the ones that top my list. This is the easiest question anyone can ever ask me. I am owned by eight birds and the love I have for this animal is vast. My favorite animal, the bird. Sweet ice tea hands down. I have to say Facebook for most of my family back in New England are on FB. It is a way to stay in touch which they do on FB. I have to say both. Let’s be honest who does not like to receive gifts? But seeing a person smile upon opening a gift I gave them is priceless. It has to be Thursday. That is the one day of the week my husband is not working at night. I love all flowers. To enjoy the many colors and shapes of the various plants lifts me up. Thanks so much for the award and congratulations to you! You made my day! I sure am! Thanks again for sharing the joy! Besides that, how have you been? I been thinking of you wondering how it is going. We need to catch up girl. I am hanging in there, hope you are doing well.